New Harmony Blenders from Quilting Treasures. I have been so happy to see and meet all of the new customers that have been coming in to Hoppin Bobbin. It has been a great honor to be in Quilt Sampler Fall issue and it has been great for getting the news out about Hoppin Bobbin. Thanks to all of our new customers for visiting. We hope that you will come again soon. Our Tuesday and Friday Sew In days have been extremely busy. I am so glad that all of you choose Hoppin Bobbin to come and spend your day with. Seating has been a little of an issue lately and everyone wants to be here early so they can get their favorite seat. While I am usually here early in the morning, please remember, that I need time in the mornings to get the shop and the class room prepared for you, before we open the doors. Doors will open, promptly, at 10am and please remember, this is first come, first served. We do NOT have assigned seats for any of our sew in days. 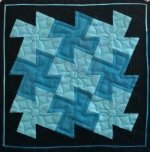 I don't want to have to do sign ups for Tuesdays and Fridays, but everyone needs to remember to be kind and gracious to others and that we are all here to share our love of quilting.